Australia will enter the World Cup year positioned as the game's top ODI team and with any semblance of Steve Smith, Aaron Finch and Shane Watson all running into dismal structure, after a fourth triumph in five matches over a messy South Africa at the SCG. The hosts had more to play for in this fixture than the guests, and it demonstrated amid their pursuit of 275, lessened from 281 by the second of two concise showers for the day. Finch, Watson and Smith all struck the ball neatly, however the recent's brilliant run of scores was kept up part of the way by some standard work in the field by a South African side missing AB de Villiers and Dale Steyn. Morne Morkel's certainty ebbed away, as exemplified by a shocking misfield to surrender a limit to Smith, who was additionally played off a Kyle Abbott no-ball and edged Morkel behind however the South Africans did not stoop to advance. Finch and Watson gave less risks, both working their path into fair touch after moderate begins to the late spring. 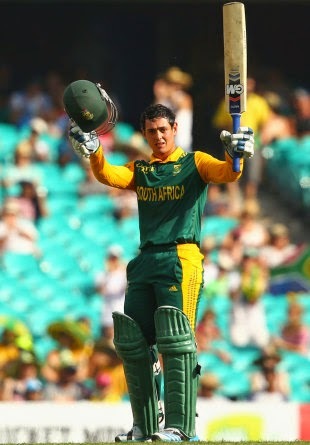 Quinton de Kock had played with balance and timing to guide the guests' innings, getting good backing from Rilee Rossouw, who had been incorporated in de Villiers' spot. Farhaan Behardien ringed in with a freewheeling 63 toward the completion, a back to front roll over spread for six from Mitchell Starc the shot of the innings. Having won the series in Melbourne, Australia's bowlers lacked a little in the way of penetration,, however Pat Cummins again played conveniently through the center of the innings and merited his three wickets.